Every January for the past 10 years, supporters of the Rotary Club of Asbury Park have plunged into the frigid waters of the Atlantic Ocean to raise funds and awareness for their service projects. This January, for the 2nd year, funds raised by Polar Plungers supported both Holiday Express, a local organization delivering music, food, gifts, financial support and friendship to those with the greatest need for the gift of human kindness during the holiday season and throughout the year; and Rotary Eye Rescue, a project that restores vision to the blind through corneal transplants. Every $2,000 raised gives sight to one person. The results are in, and the Rotary Club of Asbury Park proudly presents a check for $10,000 to Holiday Express. 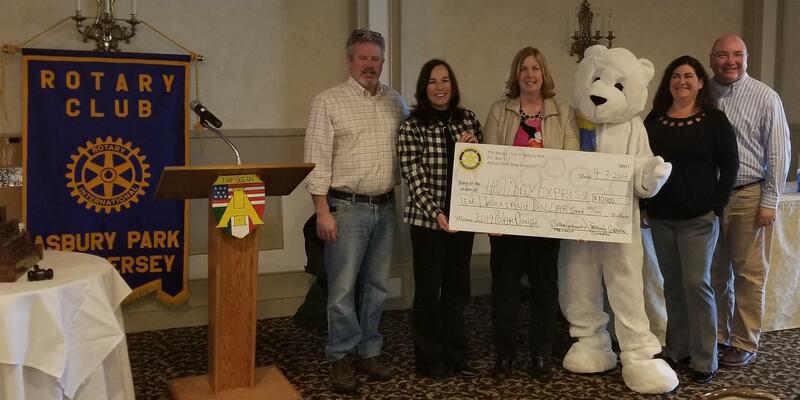 Pictured are Rotary President Sean Growney, Rotary Plunge Committee Chair Traudy Grandy, Dawn Bunyon Holiday Express Director of Marketing, The Rotary Polar Plunge Bear, Rotary Plunge Committee Member Brenda Skinner and Rotary Fundraising Chair Jeff Bassett. Planning has already begun for next year's plunge. Look for the Bear at local events in the fall!